Revisiting Dragon Warrior and How Nintendo Got Millions Of Americans Hooked On RPGs — GamingWithSwag.com - Dads By Day, Gamers By Night. Recently, my friend Dave and I were on a road trip and the discussion of the original Dragon Warrior game started somehow. Agreeing that the game has flaws, but is still really good is pretty much universal. The story is very thin, and is your basic "go save the princess and defeat the evil dragon to restore peace" plot. However, unlike the adventure games we were used to playing on Nintendo as kids such as The Legend of Zelda, Zelda II: The Adventure of Link, Metroid, and Kid Icarus, this game seemed...larger. The over world map is huge and rivals the world of Zelda II, and seemed like the world allowed for more exploration immediately upon starting the game. After getting to our destination, we met up with our friend Alex who is a huge Dragon Quest fan (Note, the series was renamed to Dragon Warrior for US Audiences in the late 1980's.) and started reminiscing of the Dragon Quest series. Although I was very familiar with the first game, my brother and I were more Ultima and Final Fantasy people. Dragon Quest was huge over in Japan, selling millions of copies and started a national phenomenon. Although I don't think the same impact was felt here in the United States, Enix continued to release the subsequent three releases here in the West to RPG NES fans. Just for a point of reference, by the time we received the first Dragon Warrior game in the United States, the third game in the series was coming out the same year in Japan. But the way Dave, myself, and other kids growing up in the 1980s initially played this game the same way. In 1989, Dragon Warrior was released on the NES in the United States. Nintendo Power heavily covered this title as it was supposed to be a huge release for the system. 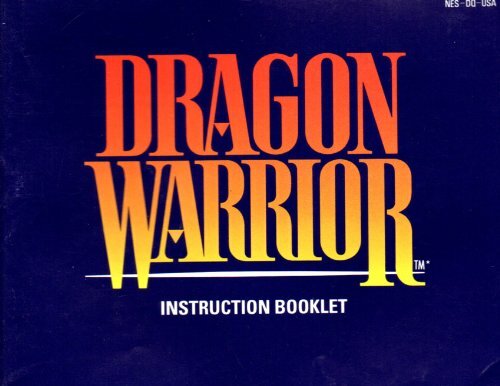 Despite several maps, a strategy guide that was included in a issue of the popular magazine, Dragon Warrior wasn't the lightning in a bottle like it was for Japanese retailers. Something had to be done. Stacks of Dragon Warrior cartridges were piling up in warehouses and retailers were not calling for reorders of the title. Nintendo decided to give away these cartridges when you renewed your subscription to Nintendo Power magazine. Given that a subscription for 1 year worth of awesome Nintendo tips and tricks was under $20, it was a no-brainer that when a free Nintendo published game that was valued at $40-$60 (depending on your area) that many would resubscribe. In addition, the subscriber would receive four additional strategy guide books: One featuring games from each system, Nintendo, Game Boy, and Super NES. The Mario Mania guide was also included that covered nothing but Mario games. These were valued at around $14.99 each, resulting in an additional $60 value. So many Slimes, so little time. We all discussed both thought that it was brilliant that Nintendo exposed millions of kids to RPGs this way. I never would have purchased Dragon Warrior on my own, and it resulted in my brother Sean and I investing in titles like Final Fantasy, Secret of Mana, Alundra, and other RPG titles. I probably would have played these eventually, but as a kid with limited monetary resources I might have passed these RPGs by in favor of other types of adventure games. While replaying Dragon Warrior this weekend, I am reminded of a time where rudimentary gameplay was overlooked because hey, it was free! But still, we had a blast venturing to Dragonlord's castle and restoring peace to the land.